Dry Eye syndrome is a very common condition which occurs when the eye does not produce enough tears. Also, if the composition of the tears changes and they then start to evaporate too quickly. Symptoms of dry eye syndrome include a burning or stinging sensation in the eye. They may also feel itchy, scratchy or gritty and look red. Your vision may seem blurry at times and your eyes can feel tired and heavy. Dry eye syndrome can also cause the eyes to water excessively as your eyes are producing more tears to try to compensate for the dryness. Unfortunately, this reflex reaction does not solve the problem as the tears don’t remain on the eye long enough to provide relief. Aging – dry eye syndrome becomes increasingly more common in later life. Hormonal changes – during pregnancy, the menopause, using the contraceptive pill. 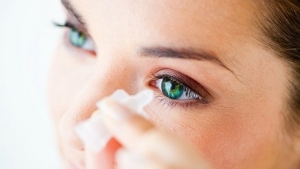 Contact lens wear – over wearing your contact lenses and wearing lenses in dry environments can lead to symptoms of dry eye. Health Conditions – certain underlying medical conditions can cause dry eye. Medication – many prescription and over-the-counter medicines can cause dry eye symptoms. These include diuretics and beta-blockers; antihistamines and decongestants; some antidepressants and anxiety medications; HRT and the contraceptive pill; painkillers. Computer Use – prolonged computer or smartphone use can mean we don’t blink as often as we should be causing the tears to evaporate more and possibly cause dry eye. Environment – Central heating and air conditioning indoors can cause the eyes to feel dry; extremely windy or dry climates can also increase the risk of dry eye. Treatment for dry eyes is available to relieve the symptoms of the condition. Artificial tears or a lubricating ointment or eye drops are all helpful in alleviating the discomfort caused by dry eye. Preservatives used in some drops to prolong their usage date after opening can cause irritation to dry eyes. Therefore, it is preferable to use preservative free eye drops. At mango optical, we recommend Hycosan Extra eye drops which are designed to provide relief for severe eye irritation. These are preservative free eye drops which are compatible with contact lens wear. They come in an easy to use dispenser ideal for those who struggle to put drops into their eyes. If you are suffering from burning or stinging eyes: your eyes are feeling itchy, scratchy or gritty and sometimes your vision seems blurry, make sure that you get your eyes checked to determine the best course of action to help relieve your symptoms. You can contact us for an appointment.